Filed to: movie reviews?Filed to: movie reviews? Folks, the critics were right. 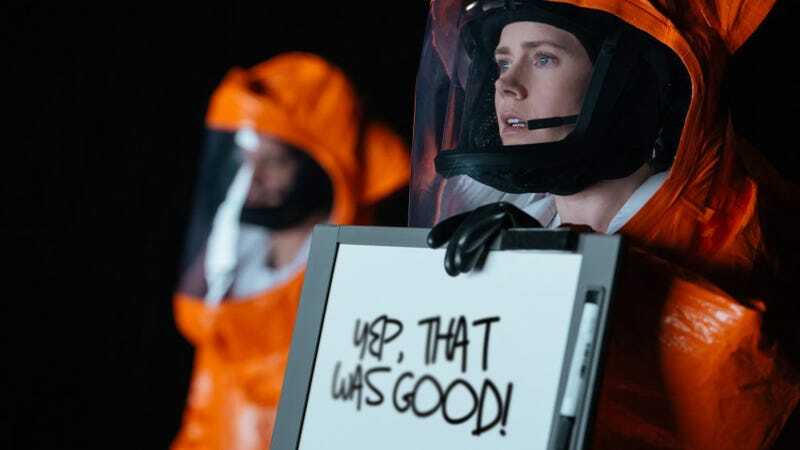 After seeing it a local multiplex over the weekend, I’m happy to report that Denis Villeneuve’s new alien-visitation film Arrival is quite good. Sure, I’d read all those esteemed critics’ claims that Amy Adams’s performance was “heart-wrenchingly beautiful” and that the film would be a “cerebral and emotional experience,” but now that I’ve seen it with my own two eyes, I’m excited to echo their praises. And now, I’ll bring my third and final blog post about Arrival to a close with these final comments: Max Richter’s “On the Nature of Daylight,” from his gorgeous 2004 album The Blue Notebooks, bookends the film to stunning effect, and I’ll have a hard time listening to it in the future without thinking of a linguist named Louise who figures out how to communicate with seven-legged aliens who spit humanity-saving ink out of their cute little starfish feet. Folks, if you’re in the mood for a beautiful movie with a dash or two of profundity that could make you feel a little bit better about the world, see Arrival. Or Moonlight. Or both!